Can we turn M5 in to a centaur with Geo Grafting ? Can we use M5 leg rigs for the horse front legs ? 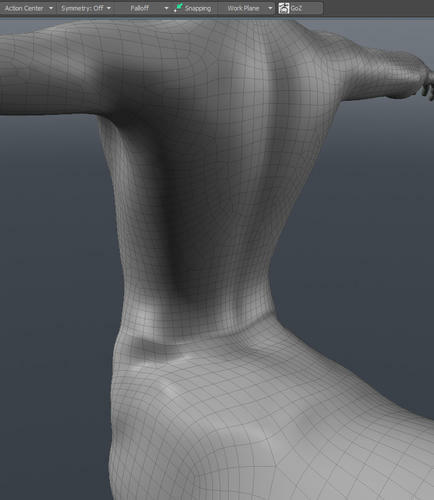 Can we add weight map rigs to the rear of the horse ? Will M5 weight map rigs stay ? Will M5 morphs stay ? Guess what I am asking is what would happen if we tryed to make a M5 centaur ? Except if you want to redistribute such a beast, you will need to run it by DAZ...still not a very clear, well defined process for this and last I heard they were still going on a case by case basis. For personal use...yeah, no problem (well, other than the complexity of getting all the weight mapping to mesh and be convincing). The skeleton part of the horse is where you really have to sit down and nut it out try and have as much similarity to genesis as you can and start with the genesis figure as a base then work the M5 morph into that. as the horse scale will have to match. Interesting that ovwer in the members forums there is a comment (in the Kids5 thread) about a number of things in the readmes of impending unreleased products which mentions a mysterious MilHorse 2. The fabled unflatable pony, perhaps? Hmmm might have a look to see what's going on ? Don't forget that for GeoGrafting to work the parts have to line up in their zero-pose, so the horse part of a GeoGraft centaur would need to be largely under the floor. The hierarchy would also be odd as the horse figure would be a child of Genesis. It wouldn't work on a separate horse figure as, as I recall, only the parent figure gets parts hidden - and of course a horse wouldn't be modelled to match the Genesis vertex positions. 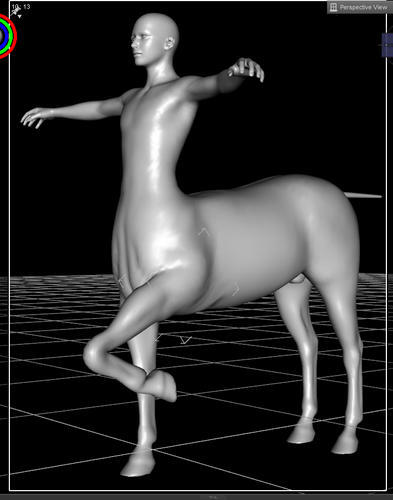 I made a pose file to put Genesis into the right position to use Hemi426's centaur package for the MilHorse. 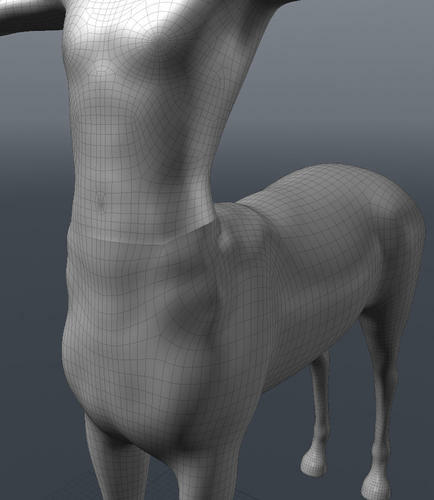 Yes, on the last point, you would have to reduce the poly-count on the horse's neck to match a suitable ring of polys around the Genesis waist in order to achieve a graft. This means it could not be done with a morph of the horse, and therefore, I presume, the horse would have to be re-rigged, not to mention re-mapped, if I am not mistaken. Then of course you have the texturing issue. Hemi426 does it the old-fashioned way, and, I think, with excellent results. As a professional product I should think a standalone figure would still be the way to go (as has already been done, of course), although I seem to recall that KempSparky was experimenting with a Geo-Grafted centaur, but he modelled the horse body himself (ran into problems, I think, which was a shame because it was looking great). The problem with a stand alone figure has and will always be support. The hybrids, whether Geografted or otherwise keep the support of their donor figures and that makes them much more attractive IMO. Yes, that's true, especially as the human element is usually the substantive part in this kind of figure. 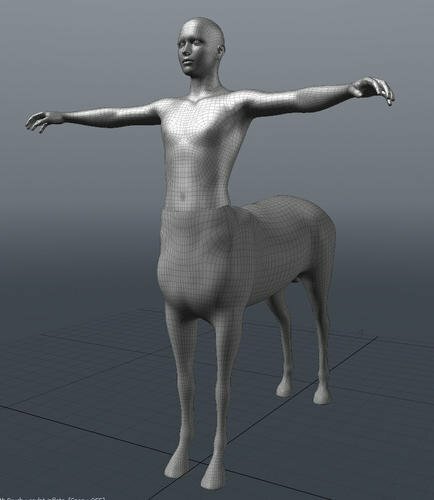 I haven't been tempted by a standalone centaur because I didn't like the human section and this cannot easily be varied (unlike a figure based on Genesis). I hope someone overcomes the hurdles of creating a Geo-Grafted centaur one day (as well as the other chimaeras). Just go to documentation wiki, and on front page, pick "recent changes". TADAH. DAZ could make a descent polycount subdividable Genesis 4 legged animal. That could morph from horse,dog,bear,cat etc etc. That you could geo graft M5 on to the Genesis 4 legged animal like a horse. 6 legged Wasp & 8 legged Spiders and Scorpions are cool to. I am sure it has been discussed, but I can't seem to locate. Is there a set of tutorials, how to, discussion on making your own Genesis Figure? Do you mean a modified genesis, or a non-Genesis TriAx figure? For the latter, have a look at Blondie's tutorial in the store. Modifying Genesis, though if I have to go from scratch I will get Blondie's tutorial (might anyways, as it looks to be some good information). Anubis is a morph, with changes in the joint centres linked to the morph, and a new UV set - the base mesh is not changed. Ahh.. so it has some kind of higher sub-division to allow and then a new UV set so that things don't look.. 'stretched/bunched' then they do some kind of merging of the two for .. the steps between combining different morphs. So I will have to learn about the adjusting the joint/rigging tied to it and the UV changes that have to be done as well. Could be possible I don't know, it's easier to get rid of the whole pelvis. I got a few monsters in the que at the moment. Nice start. I think there would be enough sales for such a creature esp one that could morph and wear a good amount of the Genesis wardrobe. Yes the geo stuff is not my cup of tea I've only ever played around with tails and horns. Matching the topology of genesis is pretty important to, so have got it as close as I could get, this is done in modo with the SUB-D on to gives you a better idea. Oh well something to do no a Sunday afternoon. Yes, I would think that would work. It might even be possible to set the UVs up so it was possible, with a mask, to blend the human texture into the hose texture though getting that set up could be tricky - it would require a LIE preset or scripting in DS, and a Python script in Poser, to make it mix-and-matchable. Looks pretty darned good to me MStories. You should contact DAZ and if your interested get the go ahead on the project. It's too bad there is no "blending" script to use a horse and human skin together and tell it to blend where the two meet up! Carrie, CauriB released MilHorse UV -> DAZ Horse 2 yesterday plus clone shape for it. So if midnight_stories bases his centaur on DAZ Horse 2, it would work out nicely. Also, please keep working on this, midnight_stories. I for one think it would be AWESOME. OK I'll give you the drum on this!!! So that means some part of the horse has to have the same set of vertex co-ordinance as genesis. there's no matching poly loop to do it with. The only way around that is a double graft and I don't think that is possible. Bone them it's not possible. to match, and I don't think that will happen.